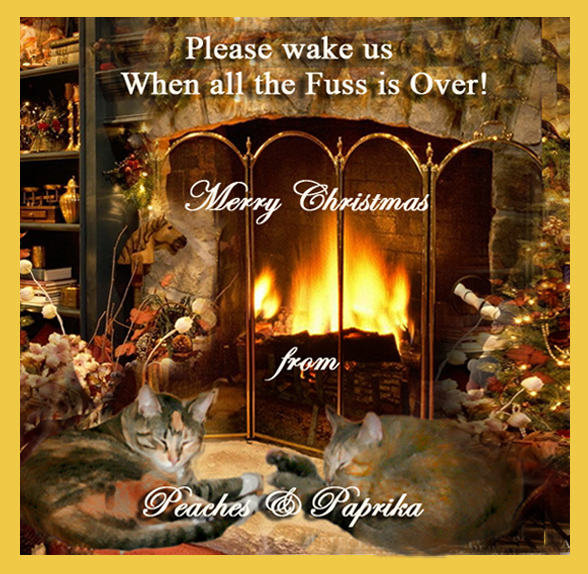 Peaches and Paprika: Please Wake Us When the Fuss is Over! What a great picture of you two just napping in front of that great fire. You all enjoy your nap. We agree Holidays are tiring, but your picture is wonderful. What a warm, inviting picture of you two, Peaches and Paprika. And I think you have the right idea - a nice long nap does sound good right about now. Purrs! Kin we hides wif youz? too much noise around here too..
You 2 look beautiful, you always do. We bet the warmth from the fire feels good. Very pretty and what a cozy fireplace. You both look very cosy in front of the fire, and I see you have kept room for me to snuggle in between you. Yes, we have saved you a place, Orange Beauty guy!